One thing I've missed about being a full time stay at home mom is spending time in the kitchen with my kids. I loved helping my girls bake pies or other goodies. Now when my boys get home from school, I'm still working, and then in the evenings I'm usually doing blogging work. I know, this past week doesn't show evidence of blogging, but we've been out of town so that's why it's been quiet around here. 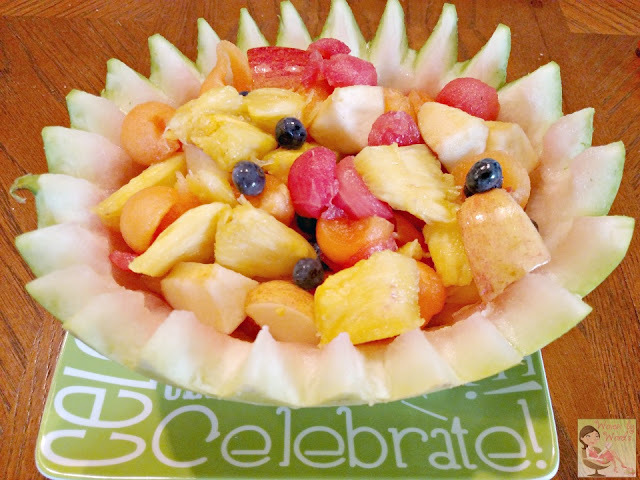 Before we headed down to Williamsburg, my youngest made a fruit salad that turned out fantastic. 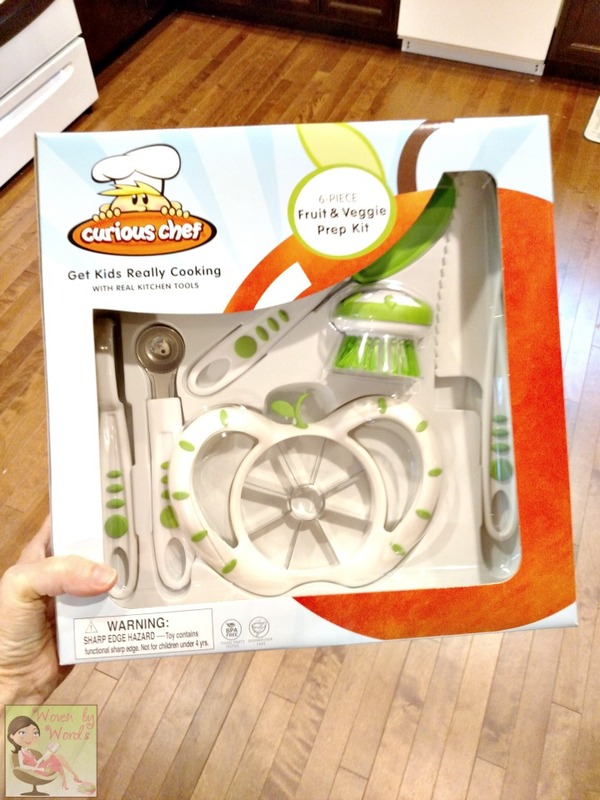 We had partnered with Curious Chef to do a review & giveaway. He's the only one who hasn't spent much time in the kitchen. When he learned we'd be using these tools, he got a cooking bug, and started making omelets! I have no idea where he came up with that, but they've turned out fantastic! We'd gone shopping for fruit, and I picked up some at our local farmers market. Shopping with him gave me the opportunity to help him learn how to choose ripe fruit. When the kids are with me, I always try to make it a learning experience in one way or another. Now, my one mom "fail" was not catching him before he started cutting up the apple to make sure he washed off all the residue on the apple. He went to town peeling it because he was pretty gung-ho about the entire process. Needless to say, I didn't have a chance to instruct him on how to use it either. I guess it's a positive that he's not afraid to take charge and get the job done. The Curious Chef came in a 6-piece set. I think he probably used the safety knife more than any of the other items. I washed them the night before so at least everything was clean before he dove in. 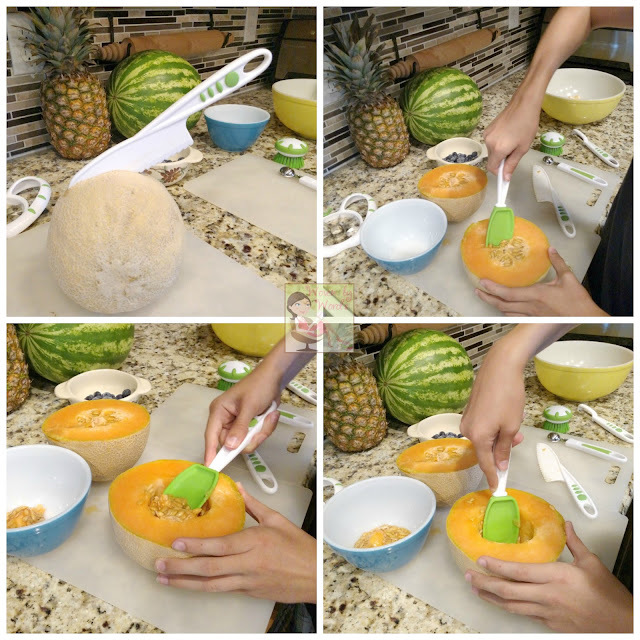 The knife was able to do most of the work cutting through a cantaloupe, apple, and watermelon. 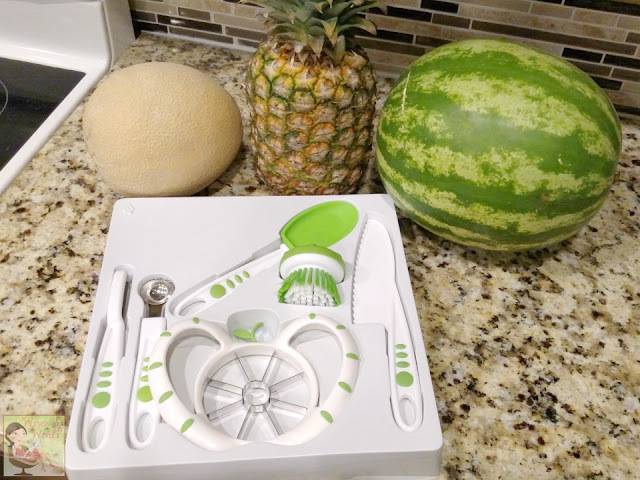 The watermelon was more like splitting it apart more than actually cutting it. It also didn't get through the pineapple well, but that's not something it should be able to cut through. Being that it's a knife that children are meant to be safe with, it's meant to cut through something that doesn't have such a hard exterior as a pineapple. 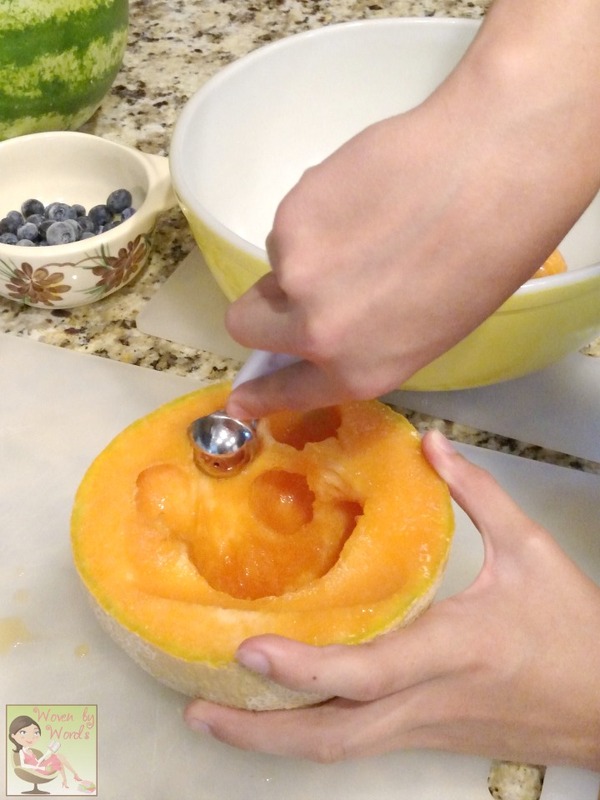 He cut through the cantaloupe just fine. That's where the melon baller came in handy. It took him a handful of tries before he figure out how to make little balls, but he got it figured out. They turned out really good! The cantaloupe I got was super juicy, and he made quite the mess with his initial tries. What fun is it if you don't get a little messy in the kitchen? Right? 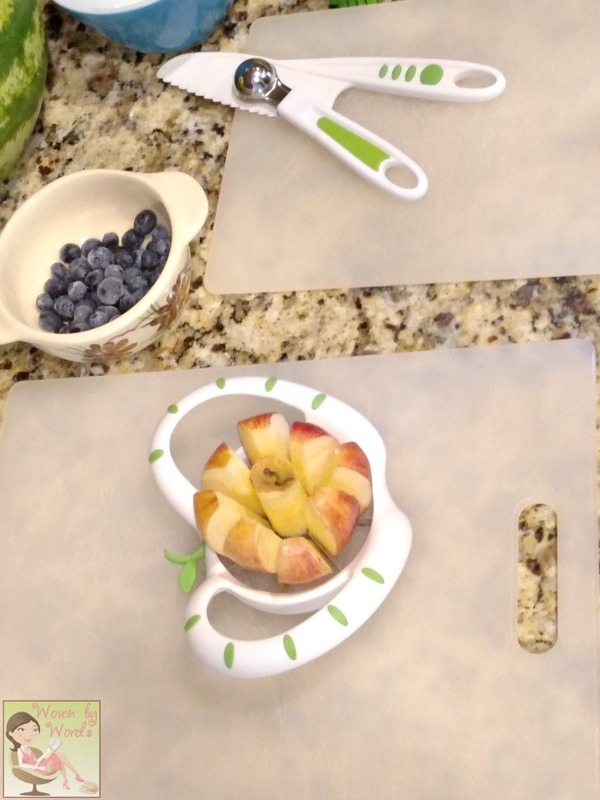 When we got to the apple slicer, he told me he didn't want me to video tape him cutting it because it uses full upper strength, and he wasn't sure if he'd get through it without embarrassing himself. I'm happy to report he got through the apple without any problems. I think because it's so wide, and so easy to hold it's better for kids to get through them. The watermelon he balled about 4 balls, and then we realized that there were so many seeds, trying to do the entire thing while missing all of those seeds would be impossible. That thing was huge! I went to have him carve the watermelon like you see at parties where they're scalloped. Well, he tried a couple of slices, and handed me the knife. hahahaha So much for persevering. Let's just say, my carving skills leave a lot to be desire. HA! This was a terrific set for my son to use. I would completely trust him to use the tools whenever he wants to make something in the kitchen. I have to admit, as I looked through their catalog I made quite the list of other kid friendly items I wanted for him to be able to use. i like the cupcake making bundle. my grandkids love cupcakes and this would be so cool for them to use. I would love the baking set for when we make Christmas cookies. Thanks for the chance. The 12 Piece Silicone Cupcake Liner Set would be great. I think she would like the 16 Piece Cupcake and Decorating Kit. Thanks. This set looks awesome. My kids would love the cupcake set. They're always baking with their big sister so I'm sure they would love to try their hands with items made just for them. The Baking Set Gift Bundle is just darling. I love that the rolling pin is sized for little ones. There is nothing there I wouldn't like but I think the fruit and veggies are my favorite. 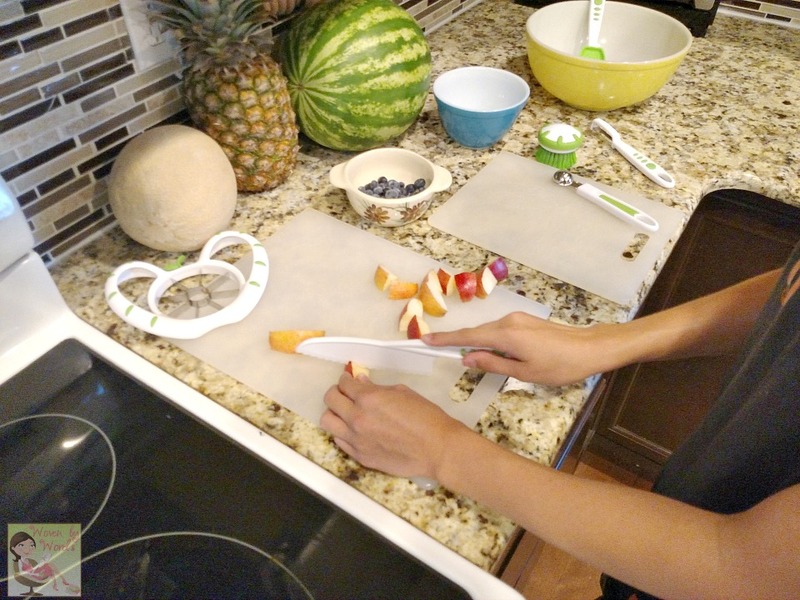 i love the nylon cookie turner, my kids really want one! I would like the cookie set gift bundle. I like the colors and designs of their sets. My son and I cook (or prep) meals together almost every day - he would love this almost as much as I would! I would love to get the Baking Set Gift Bundle for my daughter. :) She loves baking with me! I don't think I could pick just one! I know the girls would love a baking set since they love to pack! I love the 11 piece pink and green chef's kit! I like the 5 piece pie set. I like the 27 Piece Foundation Set. I'd love to get my daughter the 11 Piece Pink & Green Chef's Kit. My daughter would be head over heels for any of these. What an awesome collection for the young chef. She would really love the 30 piece caddy collection along with the cupcake set gift bundle. I have been wanting a silicone cupcake liner thingy! I love the Measuring Set Gift Bundle! Great for the beginner cook and educational too! What cute things! I like the 17 Piece Measure & Prep Kit for a start. I love the cupcake gift set! Would be so easy for the little ones to do without making a big mess!